Bay windows on 180 degree views of the incredible panorama will nourish you with light and visual delights of the lake, its volcanoes and surrounding nature and wildlife. You have a private deck connected to your cabin. Built out of Adobe, this house is the third of traditional Mayan building styles explored on the property. 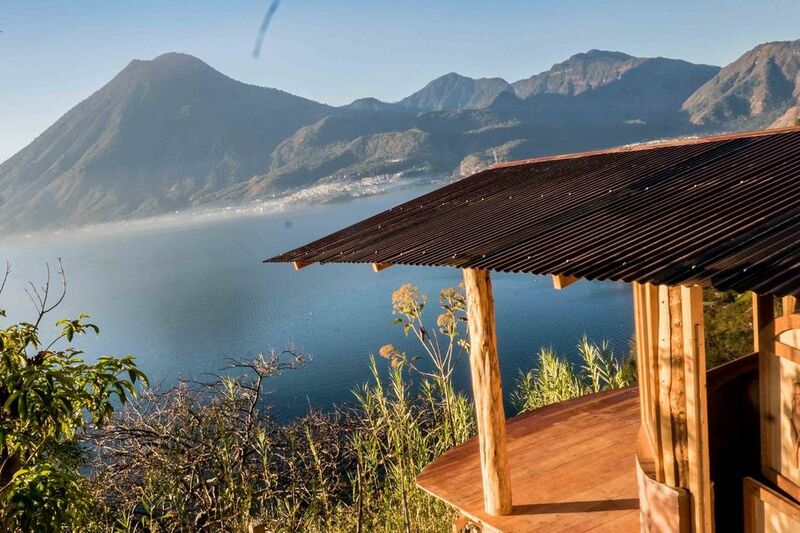 A spacious and bright room with bay windows contemplating Lake Atitlan and its immersion of stunning beauty. Your room has four single beds (setup at two sets of bunk beds) and ample more space. This cabin includes its own private deck for your use. This cabin shares shower and toilet facilities with other cabins on the property. These are located in the garden. Showers are currently cold water only. Welcome to a garden shared with others, which becomes your living room and way to connect. Kitchen, showers (cold) and bathroom are shared and located in the garden. Find other common spaces for occupying/sitting. For other spaces (like the platform space) please ask regarding access. We also run the sauna as an additional service. We have a hospitality team on-site to assist you. JB is available (via messaging,email, phone call - speaks English and Spanish) for any further assistance that cannot be resolved by our on-site team. Your stay with us is immersed with Mayan culture, as we are located at the top of a traditional Mayan village. You will meet and witness the daily reality of the local villagers. Get to San Marcos by tourist shuttle (direct from Antigua), by lancha/boat (from Panajachel - a transport hub for getting to Lake Atitlan). To get to the property you can take a TucTuc from town center to "Casa de Tim, Barrio 2" or "JaguarTree, Barrio 2" or "Casa de Gregorio, Barrio 2"
Tuctucs get you around San Marcos and to within 300m of the property. Please note that access to the property is challenging. It requires a 10 minute uphill walk through the residential traditional Mayan village.